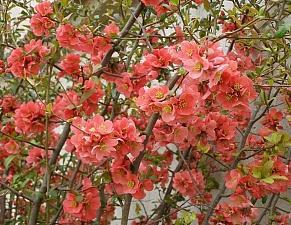 Chaenomleles, also called Japanese quince, is a group of woody, deciduous, spiny shrubs, flowering through spring. Some species may flower during mild spells in winter. 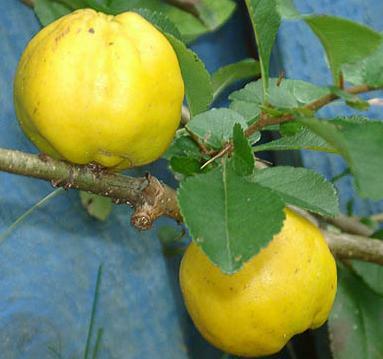 They are related to the true quince being of the family, Rosaceae. Often referred to as ‘japonica’, they are natives of Japan, China and Korea. Growing to 3 m tall, their flowers are usually bright orange-red and the apple-like, yellow fruit ripens in autumn. They are a popular shrub, grown for their bright flowers and as a natural spiny barrier. They can also be easily espaliered and their flowers provide interest early in the growing season and the fruit through autumn and into winter. The fruits are hard and too sour for many tastes to be eaten raw, though they soften after frost. They are suitable for making into preserves, jellies in particular, as they contain more pectin than apples. Care should be taken when making jellies that the result is not too solid and difficult to use. The Maule’s quince, Chaenomeles japonica, is low and spreading, producing deep red flowers. Chaenomeles x superba hybrids are similar and include ‘Crimson and Gold’ and ‘Pink Lady’. Plant against a sunny wall or along a trellis in any fertile soil. Prune back side shoots to two or three buds if trained but otherwise, no pruning is needed. Grow in fertile soil in a sunny position.